January 5, 2017: Post has been amended with information provided by a reader - in bold below. 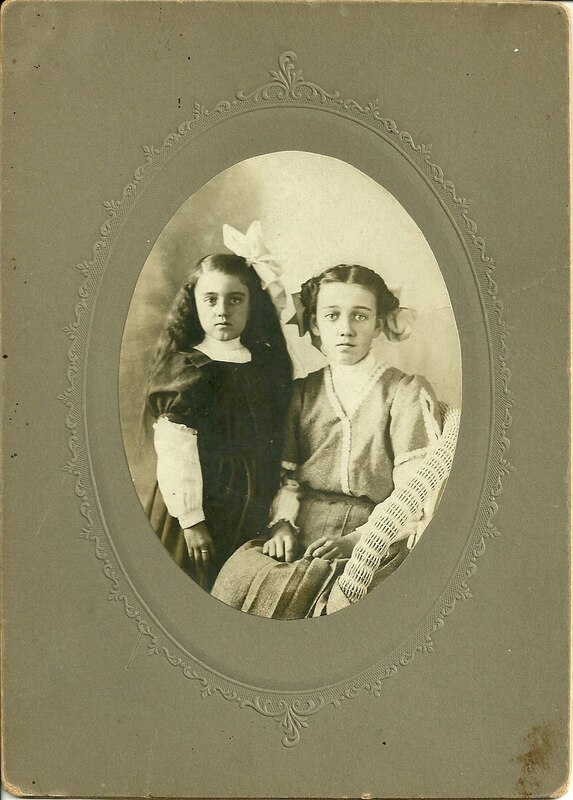 Photograph of two sisters from Deer Isle, Maine: Ruth Ellen Thompson, b. 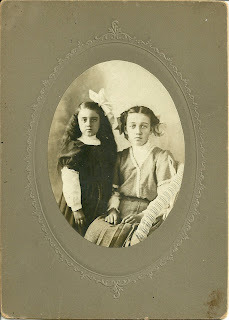 May 24, 1897, and Blanche Lydia Thompson, b. September 13, 1902. The sisters were the daughters of Frank B. Thompson and his wife Carrie Geneva (Stinson) Thompson. This genealogical information was provided on the reverse of the photograph, as you can see below. Deer Isle is a large island off the town of Sedgwick, Maine, near Blue Hill, in Hancock County, Maine. The island has been served by a suspension bridge since 1939. The island contains the town of Stonington, which comprises the southern third, incorporated separately in 1897, and the town of Deer Isle, which contains several villages, including Little Deer Isle and Sunshine. At one time the island was best known for its granite; however, the industry reached its peak in the 19th century. The lobster fishery and, increasingly, tourism, are now the primary industries. Ruth Ellen Thompson married Horace Elsbory Robbins in 1915; according to a reader, they had five children. Sadly, Horace was crushed to death by a boat, perhaps in 1922, or so I was told by an online contact. In 1930, Ruth and her children are living in Deer Isle. I believe she died in Penobscot, Maine, not far away on the mainland, in 1990. Blanche Lydia married Alma "Allie" Eaton in 1919. They were enumerated at Deer Isle in the 1920 Census and in Rockland, Maine, in the 1930 Census. There were no children listed on either Census. I believe Blanche died in 1988 in Blue Hill, Maine. 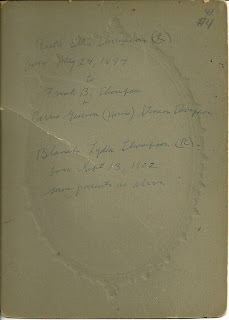 The parents of Ruth Ellen and Blanche Lydia were, as noted above, Frank B. Thompson and Carrie Geneva (Stinson) Thompson. 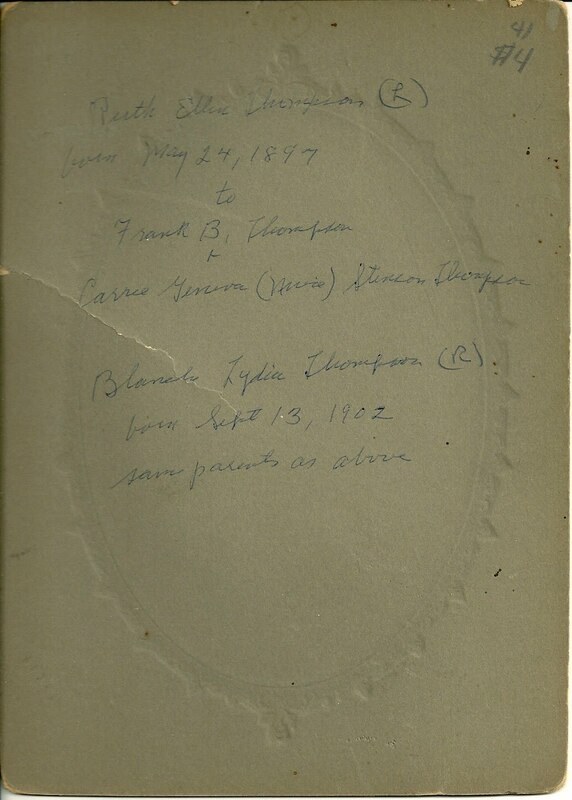 Frank B. Thompson was born in 1874 in Maine, the son of James W. and Lydia Thompson. Carrie Geneva Stinson was born in 1879 in Maine, the daughter of Steven Dow Simpson and his wife Mary. Hopefully you will find this photograph and genealogy meaningful. If you have any additions or corrections, please contact me. Deer Isle - note: the map shows the borders for the portion of the island that is the incorporated town of Deer Isle. Ruth & Horace had 5 children, not six. Clara, Elsbory (Budd), Alma, Cecil and Josephine. Ruth was carrying Josephine when Horace was killed. Ruth never remarried. Thanks for this clarification. Have amended the post.